Malneedi Nani (sharepoint consultant): How to enable or disable AutoPlay in windows 8 ? AutoPlay lets you choose an action for different kinds of media when you plug in a device, insert media, or receive content from another person using Tap and Send. 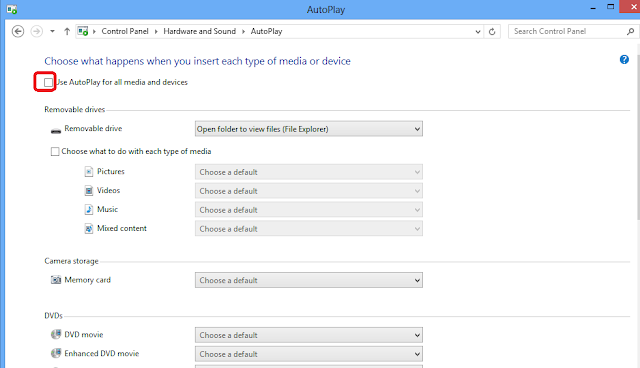 You can set AutoPlay to open different kinds of content, such as photos, music, and video on different kinds of media, such as drives, CDs, or DVDs. For example, you can use AutoPlay to select an app that will automatically open photos on a removable drive when you plug it into your PC. 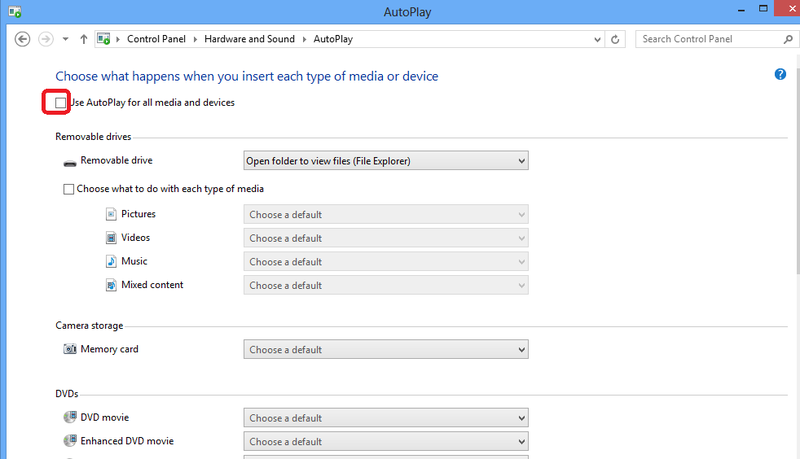 With AutoPlay, you don't have to open the same app or reselect preferences every time you plug in a certain device. Step1: Press "Windows Key + Q" to open the "App Search pane" and type "Control Panel" and select it from the search result. You can also press "Windows Key + X" and select "Control Panel" from there. Step2: In Control Panel window select "Hardware and Sound" option. Step3: Next, select "AutoPlay" option. Step4: In AutoPlay settings un-check "Use AutoPlay for all media and devices" option and click on" Save", to disable AutoPlay feature. Please feel free to post your comments, I’ll be more than happy to assistant you.